Vice President Mike Pence addresses NASA employees on Thursday, July 6, 2017, at the Vehicle Assembly Building at NASA’s Kennedy Space Center in Cape Canaveral, Florida. 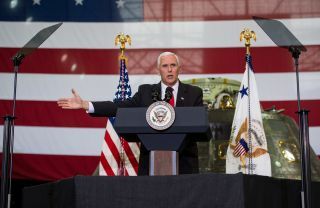 CAPE CANAVERAL, Fla. — The Trump administration will seek a heavier emphasis on human-spaceflight efforts, including crewed missions to the moon and Mars, Vice President Mike Pence said today (July 6). During a 25-minute speech at NASA's Kennedy Space Center (KSC) here on Florida's Space Coast, Pence told the 700-plus members of the crowd that the United States is "at the dawn of a new era of space exploration," and called for a return to the moon and "American boots on the face of Mars." He also said the United States will maintain a presence in low-Earth orbit. Pence chairs the newly revived National Space Council, which will advise the White House on space policy. The council will begin its work with an initial meeting before the end of the summer, the vice president said today. Pence also stressed that President Donald Trump's initiatives in space will extend well beyond NASA, though the heart of the program will be human spaceflight and exploration. "President Trump's vision for space is much larger than NASA alone," Pence said, adding that the National Space Council will coordinate policy among several federal agencies and interests, including the military and commercial sectors. Echoing Trump's "America first" theme, Pence said Trump intended to carry nationalism into space with renewed emphasis on human space exploration and discovery "for the benefit of the American people and all of the world." "America will lead in space once again," Pence said. The United States already has the biggest budget for space exploration, according to a 2016 World Economic Forum report. "From the first moon landing to the International Space Station, the U.S. government agency NASA has been leading space exploration since its creation in 1958," the report states. Trump's budget request for the fiscal year that begins Oct. 1 drops the Obama Administration's plan to send astronauts to an asteroid as a steppingstone to Mars, but maintains the program's multibillion-dollar, heavy-lift Space Launch System rocket and deep-space Orion capsule. The Trump administration's budget request also continues previous program funding for NASA's commercial partnerships with SpaceX, Boeing and other companies. Since the end of the shuttle program in 2011, the United States has been dependent on Russia to fly crews to and from the space station, which flies about 250 miles (400 kilometers) above Earth. NASA hopes to turn over crew ferry flights to SpaceX and Boeing before the end of 2018. Irene Klotz can be reached on Twitter at @free_space. Follow us @Spacedotcom, Facebook or Google+. Originally published on Space.com.